20th Century Fox & Tongal Announce Alien Short Film Contest! Topic: 20th Century Fox & Tongal Announce Alien Short Film Contest! Ohhh that's pretty cool. Haven't seen him in anything before, but it is really nice to have him involved nonetheless. So Bill Paxton's son is in one of the shorts, Alien: Alone. Class news about Paxton, Jr.
Congrats Old one,so cool to see and fun seeing one of the most badass users from this forum being in this. Did you get to direct or give input on the filming and such or just the idea/story and screen play? Visual ideas, the majority- beneath Chris Reading's fantastic Direction. Meh, not holding my breath for these. I like the names of the shorts they are intriguing. But this wreaks of stories build around bells and whistles(the cliches people think of when they think of Alien movies). We shall see if they have any real substance or end up losing any originality to playing homage and fan pandering like the bumkamp movie would have been. She means that the suit wasn't actually featured in the finished film, Jenga. It's a "technically, she's correct" thing. Anyway, these are looking pretty good. The only thing that slightly waters down my excitement is how static the Covenant xeno’s face looks in that clip. I got the impression that the suit was made as a stand-in with the intent of completely covering it with CGI. That's because it's not a hero head. 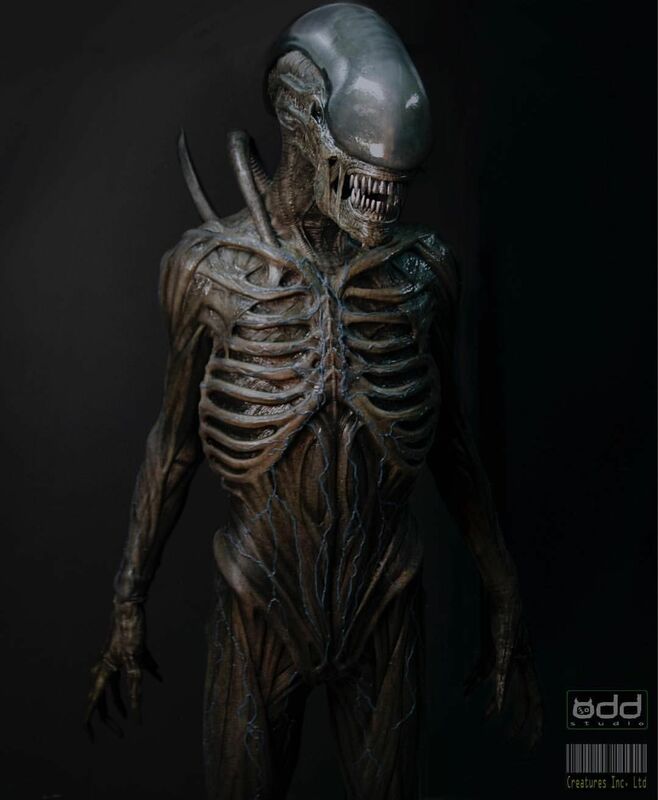 We've known for some time that all the suits were done with the knowledge that a lot of them would be removed and replaced with the CGI Alien. I know Odd Studio talked about this particular suit when it first showed up on Corden's show and I'm trying to find the quote now. Got it, it was something Adam told me in chat and I mentioned in the post. It was a stunt suit. It's just semantics at this point but there are no suits in the movie any longer so if she said essentially 'it's not the suit used in the movie...well yes it is" but you are also completely right that they removed. and one that clearly does not https://monsterlegacy.files.wordpress.com/2017/09/aliencovaliencovalienset.jpg?w=788. Maybe the latter is the stunt suit they were talking about that was loaned out for this project. Not sure what people are expecting, these are micro budgets. The suit looks fine. It's just not a hero suit so you're not going to get any snarling slow mouth opens. It's just about how they used it. From what we've seen so far the shorts look pretty good. Just hoping the whole things do! But I'm feeling pretty hopeful. Bit of behind-the-scenes stalking from Clara. "Ridge Production" wouldn't have anything to do with our own RidgeTop, would it? Not unless he's been keeping secrets from me.